In a press conference marked by erratic and un-presidential behaviour, President Trump made racially charged remarks against a Japanese reporter, telling him to “say hello to Shinzo” — the prime minister of Japan — before complaining that he couldn’t understand the reporter’s accent. The unnamed reporter, who was clearly fluent in English, asked the president about reports that Trump was considering placing punitive tariffs on Japanese auto imports. That’s when Trump made the quip about Prime Minister Abe and the complaint about the reporter’s accent. Trump then defended the idea of US-imposed tariffs on Japan — one of America’s closest allies in the Pacific rim — by complaining of a trade deficit between the two countries. Trump’s mistreatment of this reporter is charged with racial stereotype, and it comports with Trump’s history of anti-Asian stereotyping as well as with his general disdain for news media. Trump’s quip about the reporter knowing Prime Minister Abe relies upon historically anti-Asian (and, specifically, anti-Japanese) stereotypes of inscrutability by suggesting that the reporter is a state actor for a foreign government. Trump’s later complaints about the reporter’s accent essentialize the reporter as alien and foreign by virtue of his accent alone, and thereby serves as a dogwhistle assault on globalism. Trump’s mistreatment of the Japanese reporter was one of three times in Wednesday’s press conference that he complained of fluent English spoken with a non-American accent. Alongside this disgusting behaviour, the president also targeted two Black women reporters. In a baffling outburst, he berated April Ryan of American Urban Radio Networks for allegedly interrupting another reporter (she did not) and ordered her to “sit down”; and he accused NPR’s Yamiche Alcindor of a “racist” question when she asked him about self-identifying as a “nationalist”. 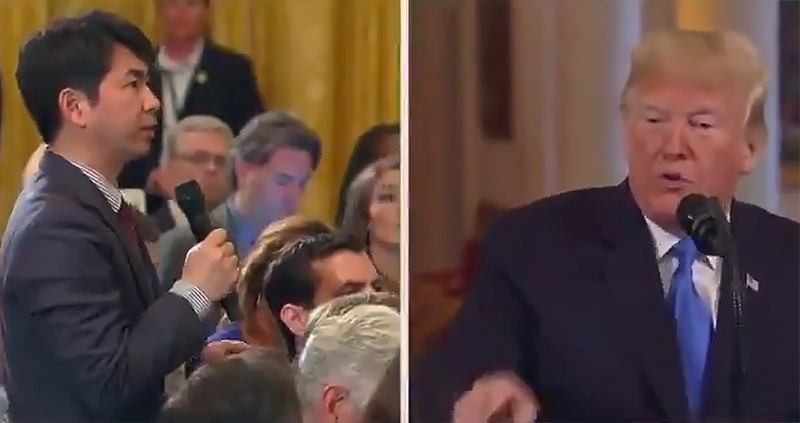 Also during the press conference, the president got into a heated exchange with CNN’s Jim Acosta over Trump’s mischaracterization of a caravan of refugee-seekers travelling to the United States as an “invasion”. In response to Acosta’s attempts to hold Trump accountable for that racialized fear-mongering, the White House revoked Acosta’s press credentials and is threatening to do the same to other reporters. The president’s explosive ramblings on Wednesday paint a clear picture: the president is a puerile racist and a xenophobe, and he lashes out at anyone who challenges him on those backwards and regressive ideas. Between this and the many ways in which he flouts the federal law to rule the country like a petty despot, it’s time to ask ourselves: when can we start impeachment proceedings?